Prevent Damage and Down-Time from Needless Impacts to Your Doors with Informational LED Door Kits! 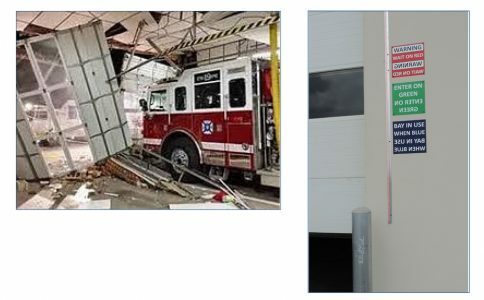 The NOVA Door position light kit is a Door Condition Awareness System (D-CAS) which informs drivers of the state of a drive-through overhead door even when the driver is unable to see its position. A 10′ colored LED Light strip is mounted to both the inside and outside of the door. A driver pulling in or backing in is supplied with door travel information. LEDs are off (or solid red) when door is down, flashing red when in motion, and solid green when door is fully open. Reduces door and vehicle damage, lost product, and unnecessary costs when installed. Acts as a power loss indicator – LEDs flash RED if the operator loses power. When installed in firehouses and EMT stations, the Red LEDs preserve night vision and reduce the need for harsh white lights during evening hours. Compatible with most commercial garage door operators. 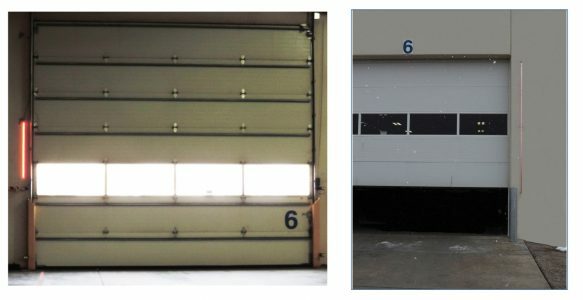 Optional Blue Light (BL) feature informs awaiting vehicles if there is already a vehicle on the other side of the door; potentially reducing loading and unloading delays caused by the need to move because the bay already has a truck inside. LEDs are IP68, Waterproof, UV Protected and highly visible in the daylight. Two 10′ sections LEDs w/40′ of cable and 20′ of double-edge flat track for mounting, one NEMA rated enclosure w/LED Controller + 120v/12v power supply, and inside and outside signage. 15′ and 20′ LED segments available for added visibility. Four retainer styles available for non-standard installations. Blue Light (BL) Feature* informs approaching vehicles if the bay is already occupied. *Utilizes BEA LZR® Widescan Technology.